We are always delighted to hear from couples interested in being married at St Stephen Walbrook. We would love to discuss your needs and see whether we can help. 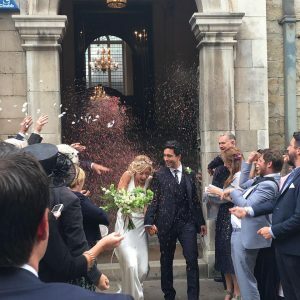 The Church of England is historically arranged into geographical parishes, and as the law currently stands, you are entitled to be married in the church of the parish in which you live. 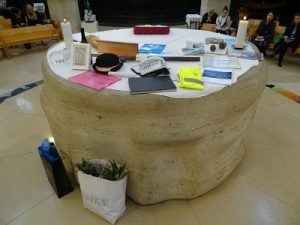 Very few people live in the parish of St Stephen Walbrook; so if you would like to be married here, there are some simple formalities that need to be observed to meet the qualifications in other ways. These explained in our leaflet on ‘Getting Married at St Stephen Walbrook’. Please read this and then telephone or email our Priest to discuss your needs. Many companies, charities and other organisations choose to hold their Carol Services in the stunningly beautiful setting of St Stephen Walbrook, which is especially beautiful by candlelight. Please contact us as early in the year as possible to discuss our availability, as many organisations return year on year and book well in advance. We are a central location in the City which is frequently used for Memorial Services. Our circular seating layout provides an appropriate intimacy for such services, while still accommodating congregations of 250 – 350 people. Please contact us to discuss your needs. You can either phone us, or send an email the details of which you will find on the Contact Us page. 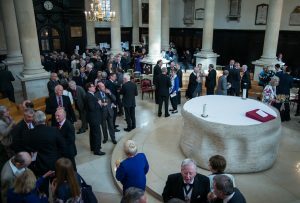 At St Stephen Walbrook we have a tradition that companies in the parish designate someone to bring an object to represent their work and to place it on the altar as a symbol at the beginning of our Business Harvest Festival service. The Business Harvest Festival is held at the beginning of October. Those who marry at St Stephen Walbrook, as well as those in our weekday congregations, view St Stephen Walbrook as the church for their family. Baptisms can be incorporated into weekday services but, generally, families prefer to have these services held on a Saturday. Please contact us to discuss your needs. We offer families with young children the opportunity to keep in touch with St Stephen Walbrook through termly family-friendly sessions held on Saturday mornings. 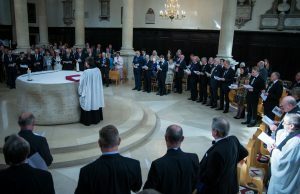 It is unusual for funerals to be held at St Stephen Walbrook as so few people live in the Parish but if you wish to explore what is possible do get in touch.